Siemens Mobility and ViP Verkehrsbetrieb Potsdam GmbH will be presenting their research project on the world’s first autonomous tram at InnoTrans 2018. 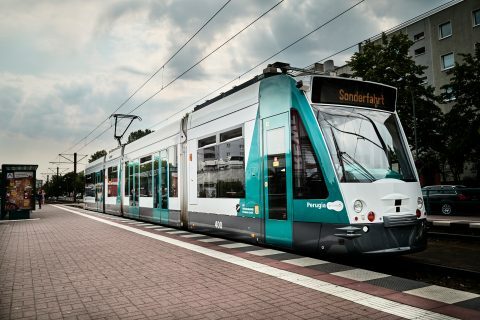 Siemens will be demonstrating a test tram driving autonomously in real traffic on September 18 through 21 on a six-kilometre section of the tram network in Potsdam, Germany. A Siemens Combino tram has been equipped with multiple lidar, radar and camera sensors that serve as “digital eyes” by capturing the tram and its traffic environment. Algorithms function as a “brain” by interpreting and evaluating data from the momentary operating situation, allowing the tram to predict further development of the situation, which in turn then triggers an appropriate response by the tram. Its artificial intelligence capability allows the tram responds to trackside tram signals, stops at tram stops, and reacts autonomously to hazards such as crossing pedestrians and other vehicles. According to the company, Siemens Mobility is the first company to launch an autonomous tram for research and development purposes. The experimental tram is not designed for commercial use. The current project aims at identifying the technological challenges of autonomous driving under real-life conditions, then developing and testing solutions for them. A continuation of the cooperation is already being discussed with ViP. “This world premiere demonstrates how we are actively shaping the mobility of the future. Our autonomous tram can already master essential operating tasks in real road traffic at this stage of development. By relying on the “Siemens Tram Assistant” collision warning system, we have already reached series maturity – an important milestone on the way to autonomous driving. By making trains and infrastructure intelligent, we can guarantee availability and enhance safety in local and long-distance travel,” said CEO of Siemens Mobility Sabrina Soussan.